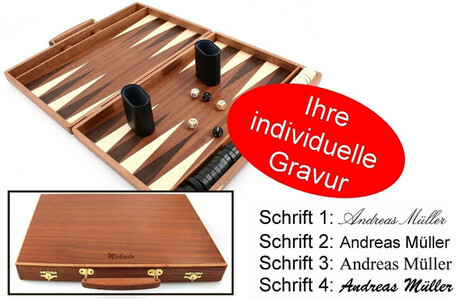 A nice idea for gifts: The engraved Hardwood backgammon case mahogany from Weible. Pitch inside is pear tree black and anigree. Incl. accessories - pieces of wood, two dice and dice cups. Dimensions: 35 x 24 x 4.5 cm. Weible is known for the excellent quality of materials and quality workmanship.